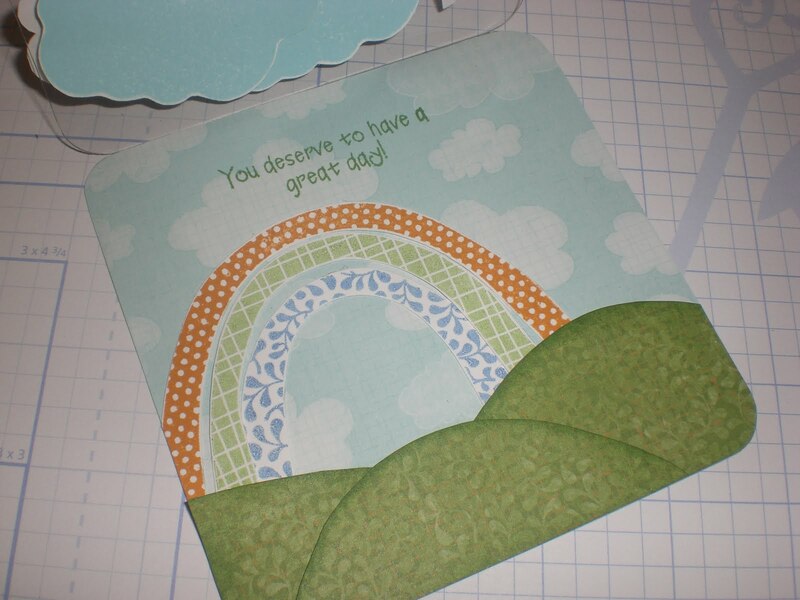 Here are the projects we did today in our card artistry class. I wish I could take credit for all of these wonderful projects, but I can't. 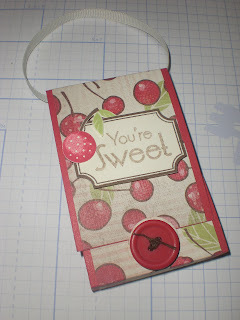 The first project is a Treat Holder using papers from the Cherry-O Level 2 Paper Pack and the "You're Sweet" and "Tasty Treats" stamp sets. I got the idea from Tresa Black's (aka The Stamp Goddess) YouTube video for a Halloween Treat Holder (which she credited to Chicknscratch on YouTube). This next card was designed by another CTMH consultant, but I can't remember who. :( I'll try and find it again, so I can give credit where credit is due. I just thought it was so cute. It uses the stamp sets "Over the Rainbow" and the sentiment is from July's Stamp of the Month "Happy Forever". 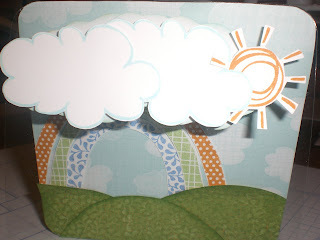 This cards in this project were inspired by Tresa Black and the box was inspired by Gloria at Happy Scrappin' 'n' Stampin'. 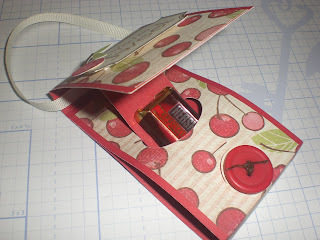 The envies and box top design were my design. 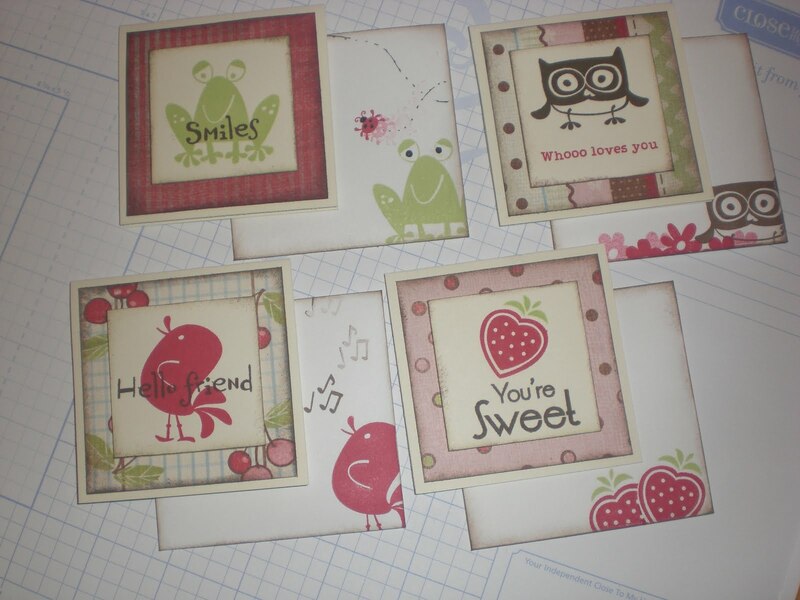 The cards and evelopes were made using "Hot Diggity", "You're Sweet", "Whooo Loves You" and the "Summer Wishes" stamp set from the Splendor Workshop-on-the-Go. 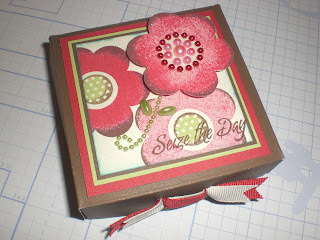 The top of the box was made using "A Posey" stamp set and the sentiment is from the "Something Splendid" August Stamp of the Month. I also used the Opaques Cherry-O Adhesive Gems.